It turns out that helping a Hollywood studio make a couple billion dollars opens some occupational doors. Ergo Wally Pfister, Christopher Nolan’s Oscar-winning cinematographer on Inception and the Batman films, jumps into the director’s chair for the first time with Transcendence, a techno-thriller that over the course of two hours systematically squanders an interesting concept, in deflating fashion. If science fiction can, intellectually and production-scope wise, either go big or go home, Transcendence is the latter version masquerading as the former: an over-plotted movie—glossy and expansive but about two inches deep—of contrasting wingnut philosophies and flat-line emotional affect. Dr. Will Caster (Johnny Depp) is a hotshot scientific researcher and Wired magazine cover boy who strives to marry next-generation artificial intelligence with a machine that possesses self-awareness and expressivity. His partner in work and life, wife Evelyn Caster (Rebecca Hall), is a more socially minded activist, envisioning science as a tool to change the world. When in a massive coordinated strike Will is felled by a group of extremists who oppose unfettered technological advancement, both Evelyn and Will’s colleague and friend, Max Waters (Paul Bettany), upload his mind and memory into a computer to try to save him. Their experimental gambit works, but the rebooted Will also has a rapacious quality he justifies by the end goals of societal betterment. As he and Evelyn set up in a dusty Southwestern shantytown and embark upon a sprawling campaign of engineered change, it puts them at odds with parties working to stop them, including Max, mentor Joseph Tagger (Morgan Freeman) and the obligatory FBI agent, Donald Buchanan (Cillian Murphy). If it seems a bit of a clichéd criticism to charge that Transcendence is a movie more preoccupied with its visual prettiness than the intellectual rigors of its story, it nonetheless remains true. Pfister, working with cinematographer Jess Hall and a capable production design and digital effects team, delivers a film that dutifully replicates things one might want to see in a story like this: close-ups contrasting the glow of formula-filled whiteboards with idyllic nature; moments of nanotechnology razzle-dazzle; and, of course, a couple cool bursts of striking action, as with scenes of particles floating up from the ground to the sky. Worse, Transcendence doesn’t cleanly establish the angles and parameters of Will’s growing omnipotence. At one point the movie flashes forward two years, never bothering to really explain how he and an on-the-lam Evelyn might be able to literally build a new tech company and fortified compound without attracting the attention of former colleagues, the federal government or, you know, a group that was doggedly attempting to assassinate Will. All of this doesn’t even address the irony of an organization of zealous neo-Luddites tracking figures via GPS, or smaller plot hiccups which find the same group somehow magically intuiting Evelyn’s intent about connecting Will to the Internet, which is the action that kickstarts her fleeing and sets Max on an oppositional path. 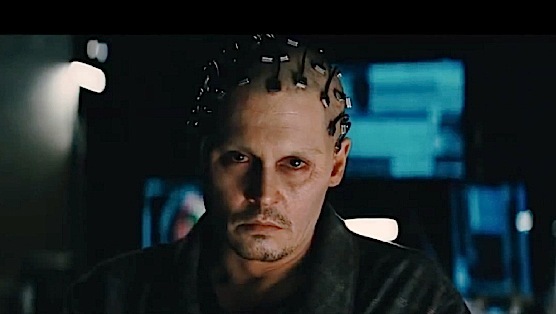 Most problematically, Transcendence’s characterizations are just wafer-thin, and/or vague. Will and Evelyn’s relationship, and the changes and strife it suffers in its incorporeal state, are given a couple nice moments, and there’s a late scene in particular which hints at a more interesting and fraught love triangle dynamic that could have infused the film with some much-needed extra human dimension. But Paglen seems too scared to follow this, the most interesting part of this story, down the rabbit hole. Instead, he leans on hoary, gun-waving antics. It doesn’t help matters that Pfister lacks an intuitive touch with actors. The cast struggles to create moments that connect outside of the film’s plot machinations. In such an important yet largely disembodied role, Depp is unable to effectively convey the restless creative ambition necessary to cast a shadow over the movie. Hall, a fine actress, is left handcuffed by a screenplay that posits Evelyn is an intelligent scientist in her own right, but almost utterly incapable of independent action; there’s less an arc for her here than a kind of half-blink realization, played out in one-note fashion. The rest of the actors, meanwhile, are merely playing types—the Hard-Charging Federal Agent, the Avuncular Colleague, the Revolutionary With Regrets, etc. A few faint moments of genuine human feeling register intermittently, owing to craft and experience, but there’s otherwise absolutely nothing to tether viewers to the supposedly grand stakes of the film. Overstuffed but underdeveloped, Transcendence mistakes serial incident for dramatic connection.